Using packing which protects your clothes from dust and damage. Caring for quality from collection to delivery using highly recommended products and materials. We have qualified people with a proven track of experience in laundry. Eastern Rose Laundry is a leading laundry and dry cleaning services company in the UAE and was established on 1985 with years of experience in dry cleaning and laundry services, we handle the most delicate of fabrics... Be assured that your garments are in safe hands! Full dry cleaning services for all your cleaning needs. 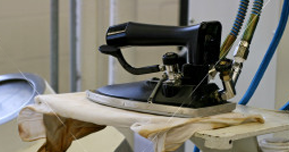 Eastern Rose Laundry specialists in cleaning suede and leather garments, treasured outfits, wedding dresses, and we will always offer you sound and honest advice. Eastern Rose Laundry have an ongoing and continually evolving programmer which refines our systems, as well as ongoing staff training which enables us to continue offering their unique high level of customer service. Copyright 2008 - 2010 ERL. All rights reserved.